I think this guy may have been pushed out of his house for the weekend by Carpet Call. 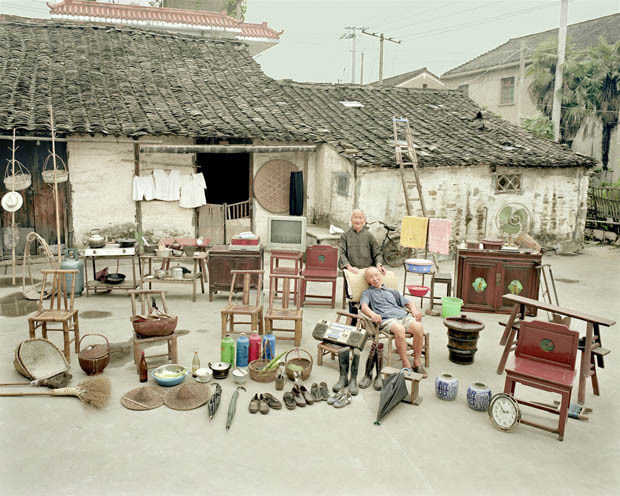 No, seriously, it’s a set of portraits of Chinese families with ALL their possessions in front of their houses. Most have a lot less than this guy. Oh, frustration. When an Epson printer has one ink cartridge out of eight run dry, the printer stops. Even though you’ve got black ink, you still can’t print if a colour runs out. Therefore my big printer is dead. So I just go out and buy more ink, right? Not for this one. No-one stocks Epson 96 inks – too high-end. I’ve had to order on-line and now I wait. How long? No idea. Grrrrr. Similarly, I’ve finished another book and try to send it off for printing (Photobook Australia). It takes me half an hour just to log in to the web site! Every step, every button click takes 3-5 mins of waiting, and often times out, meaning I have to start again. So I wait for a quiet time, 11pm last night, 2am Sydney time. This time it takes about 30 minutes total, but I finally get through the payment rigmarole and start the upload. Wow, it starts well, zipping through the files. Then the estimated time jumps from 11 mins, to 20 mins, 30 mins, 1 hour, two hours, three hours. At least progress seems to be happening, but I can’t stay awake and go to bed. This morning, it’s still on page 1! Endlessly seeming to progress, then going back to the start and restarting. At one stage I had 41 of 43 files done, but again it stopped and restarted at file 1. Then the browser crashed and I lost it all. GGGGGGRRRRRR! I have the order number and a receipt, so I’ll just have to phone them and send it on a CD by post. Luckily, I’m using two vouchers I bought in 2010, so all I’m having to pay is $15 postage. After all the years of crap service by the local IGA at North Beach Plaza (out of action for 4 months from a fire in 2009, and hopelessly empty shelves due to cash flow problems for the past 12 months), we’ve finally got new owners there, Farmer Jack’s. Wow. Full shelves again, and nice stuff. A whole cabinet devoted to cheeses of the world. Fresh salmon at $19.95 per Kg. Fresh Coffin Bay oysters at $11 per dozen. And they’re just starting up. This has the potential to revitalise the shopping centre. All we need now is a good deli. The bakery is nice, run by Vietnamese. It has a real butcher and good greengrocer. The Soda Cafe upstairs is quite good and fully licenced. There’s a full grog shop too, which is more than Carine has. All this just as I’m nearing moving out of the neighbourhood! Memoirs. It’s amazing. I’m outlining my life’s memories and the more I write down, the more that comes back. I’ve just remembered Farrell’s garage in Bruce Rock. I haven’t thought of that in nearly 60 years. I was thinking of the old hand operated petrol bowsers and there’s a metal one, about half life size, as a clock in a gift shop at Gwelup. All weathered and grimy too. Model railways, speaking of weathering. What other items do we buy that we immediately want to make dirty and grimy? Model trains represent real life, and real trains are dirty! So we deliberately make the models filthy dirty. Not that I’ve bought any yet, but I will be, just as soon as … I’ve been thinking about it for months and what to model. I’ve downloaded all the Google Earth images of Perth and the rail lines right out to Northam, and had them printed at A0 size, huge. It’s too big to model directly, but you make a representation. Thinking about it. Speaking of Google Earth, I wanted to find a particular building in one of my shots of Venice. There’s no street view of Venice, because there are no cars to drive around taking the photos, but the 3D buildings views are amazing! The level of detail is nearly as good as actual street photos. It’s fascinating, well worth a look. Almost better than street view. See it while you still can. New Scientist magazine: Our Predictions of 5 Years Ago Were Worst Case Scenarios. The Reality Now, 5 Years Later, Is Even Worse Than We Predicted. A James Cook University professor on ABC Radio yesterday: there are tipping points in climate change, where the effects become irreversible. We have now reached 3, 4 or 5 of those tipping points. Climate change is happening NOW, so fast and so seriously as to be irreversible. He said the Great Barrier Reef is now irreversibly damaged, and there cannot be any more dredging or fertiliser runoff without wiping it out. We have only 10-20 years to stop the damage occurring, or it’s too late. It’s nearly too late for Venice. Sea level rises of 1m are now being talked about seriously. That will destroy Venice. I’ve been there and seen it. Have you? Hmmm, nearly a month with no post. Sorry about that. No particular excuse, except that I’ve tried once or twice and something always seems to go wrong with this WordPress software. I’ll finish writing, then find the Publish Post button is greyed out and won’t let me post. There seems to be a time limit. Or at other times, the Publish button is active, but after clicking it, it thinks for a while, then says Unauthorised. What? I’m logged in, otherwise I wouldn’t be able to write. What does Unauthorised mean? There’s no explanation. My leg is nearly healed. Not quite – there’s still a little bit that needs covering and Silver Chain are still coming twice a week,but we’re nearly there. But I’ve got another big abrasion on my right knee now. I was dreaming a week or more ago and in the dream I was kicking someone away, rather violently. Suddenly I kicked myself out of bed onto the carpet and sustained a nasty carpet burn. Yowch. So forewarned, I’ve taken good care of this large raw area this time. I’ve been to see the vascular surgeon and depending on the result of a deep vein ultrasound, he may want to do a venous ablation – putting a cather up from ankle level up to groin area and blocking off a vein that’s leaking. I said, “But, but … I’m using that vein!” No, he said, you’ve got plenty and another one takes over or another one grows. This will, I hope, reduce the swelling in my left leg and reduce the susceptibility to ulcers. He also wants me to wear pressure stockings as a daily thing. Not just the ones you buy in the shops, really tight pressure stockings, knee highs. But when I priced them, $69.95 per pair! Wha …? Not at the moment, doc. No money. Maybe later. I was going to buy two or three pairs so I can wash them. Huh. We had a home open yesterday and there may be an offer in the offing. It’ll be an offer conditional on another sale, but I’m not in a rush, so it may work out. I’ll sure be happy to move out of this mess of a house, though. I’m pretty tired of this temporary life. I’ve finished the Java book and it’s ready to be printed, but the cost is $278 per copy. That’s too high for me at the moment, so it’ll have to be pdf format on CD ROM, which works quite well. I’ve also done another book, this time on Venice, and I’ve got pre-paid vouchers for two 11″ x 11″ copies, so I’ll send that off asap. The two Venice Blu-rays are just about ready too – one is 11 mins of stills only and the other is 30 mins with HD video as well. Then the next book is on the way – a collection of my best images over my 45 years of photography. I’ve also made a start on my memoirs – not a tell all autobiography, just all the memories I have, and I have a hell of a lot! One of my friends said he can’t remember much of his early years. Odd. There must be a reason. I can remember everything! Well, I can remember what I can remember, which is not the same thing, but I’m doing it in outline form and boy, the sub headings just grow and grow and grow. The more I write, the more it comes back. Even smells and sounds. It’s a pity we can’t put those down on the page. The news is saying the floodgates are opened – people are speaking up now in anticipation of the Royal Commission who would never have revealed their horrors otherwise. This is just the beginning! Minnie is as happy and smiling as ever. The cyst in her side is huge now, but she lies on it to sleep, so I’m convinced she’s not in pain. But she’s starting to struggle to heave her back legs up recently. Uh oh. I had dinner with some former and present Channel 7 mates last week, and one of the former (graduate) engineers told me what he was being paid when he resigned in 1985. It was poverty wages. He resigned because he couldn’t live on his salary. It was less than the secretaries were getting and a lot less than I was getting – but I was in the union and being paid award wages, which still weren’t great but it was 50% higher than his salary. He said when he resigned, they were shocked and offered to double his salary and throw in a car. But it was too late! That was the pattern for all the 33 years I was there – they wouldn’t listen, wouldn’t read the signs, and didn’t particularly care when they were losing good staff. I’m still angry. They do not value their staff! Not in Engineering. One of the present good techs has just resigned, only a week or two ago, and again they got a shock. He’s turned 55 and realised he wants to do more with his life, but part of his job was the helicopter avionics. You don’t find people like this at Centrelink! They’ll find it impossible to replace him – even if they find a chopper/avionics tech, he won’t have broadcast TV experience. So once again, they don’t read the signs, don’t see it coming and don’t do enough to hold onto their staff. I spit. Just as for the Nearly There post below, the same thing has happened again. I tried to insert a photo, it sat there for over ten minutes spinning its wheels with no action, then when I tried to publish anyway, it crashed and lost ALL my last half hour’s work. This is IMPOSSIBLE!